Q2 earnings season is off to a strong start. But… Wall Street analysts are not yet raising their Q3 numbers. In fact, across most sectors they are actually trimming their expectations. The notable exception so far: Financials, where numbers are rising and the stocks are responding positively. More reports on tap for this week, so perhaps those next-quarter estimates can still move higher. The old saying “the proof is in the pudding” doesn’t mean quite what you might think. First of all, the full version is “the proof of the pudding is in the eating”, which carries a more complete idea. You have to try food in order to know if it is any good. But it’s not pudding as in the modern Jell-O instant version to which the aphorism refers; it is sausage. And not the neatly packaged stuff you buy frozen at Whole Foods, either. We’re talking about 17th century, pre-refrigeration British sausage. Exactly the sort of food one would approach with rightful – and extreme - wariness. It is in the spirit of the vivid historical warning that we approach an analysis of Q2 2018 US earnings reports to date. Yes, the numbers look great (more on that in a minute), but how analysts and the market digest them is what really counts. #1. 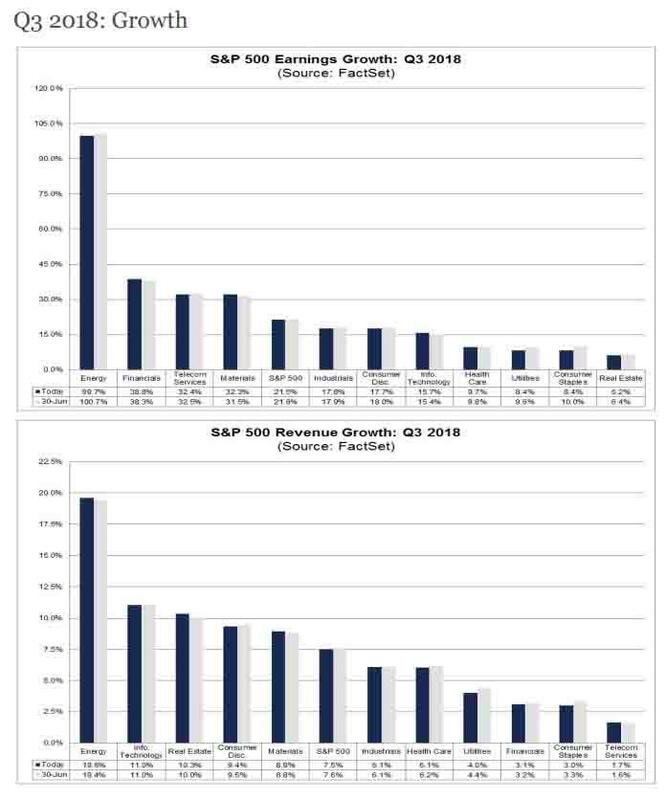 Overall, both revenue and earnings are beating expectations by an above-average rate. 17% of S&P 500 companies have reported Q2 earnings so far. 87% of those have beaten analysts’ earnings estimates, a rate above 1-year (75%) and 5-year (70%) averages. In aggregate the companies that have reported so far have exceeded analysts’ revenue estimates by 4.5%, behind the 1-year average (5.6%) but above the 5-year average (4.4%). Revenues are coming in ahead of expectations by an average of 1.4%. That’s above both 1-year averages (1.2%) and 5-year (0.7%). Our take: it’s early days for Q2 earnings season, but so far this is looking to be a very good reporting cycle. Keep in mind that baseline expectations were already high, with Wall Street analysts looking for 20.0% earnings growth on average. If this week’s announcements look as solid, US equity markets should see further modest gains and lower volatility. Consensus estimates for Q3 earnings growth are down 10 basis points for Q3, from 21.6% on June 30th to 21.5% today. Expected revenue growth is lower by the same 10 bp, from 7.6% to 7.5%. Industries where earnings estimates are rising: Financials, Materials, Technology. Industries where estimates are falling: Energy, Telecomm, Industrials, Consumer Discretionary, Health Care, Utilities, Consumer Staples, and Real Estate. Our take: this is not what we expected to see, given the magnitude of the beats so far for Q2. Our explanation (for now) it that the revisions will come as more companies report and analysts assimilate all that data into future earnings expectations. That Financials – one of only 3 groups showing higher Q3 numbers - rallied last week (+2.2%) when the S&P 500 was flat shows how important earnings revisions will be to future market gains. #3. Even with those sluggish Q3 revisions, aggregate expected S&P 500 earnings continue to tick higher. This helps US equity valuations look a touch more affordable and offsets some of the obvious macro risks (trade wars, Fed policy uncertainty, etc.). Consensus S&P earnings for 2018 are $161.24 and reached a new high just this week. With the index at 2802, that makes for a 17.4x price earnings ratio. FactSet estimates the current 12-month forward PE at 16.5x. This is above both the 5-year average (16.2x) and 10-year average (14.4x). Numbers are also still rising for 2019 expected earnings, which now sit at $177.20 for the S&P 500. This is where US stocks actually look cheap, at 15.8x, especially given 10-year Treasury rates that remain below 3%. Our take: as a long time cyclicals analyst, big earnings numbers scare us because they are hard to reproduce for long (let alone grow further). 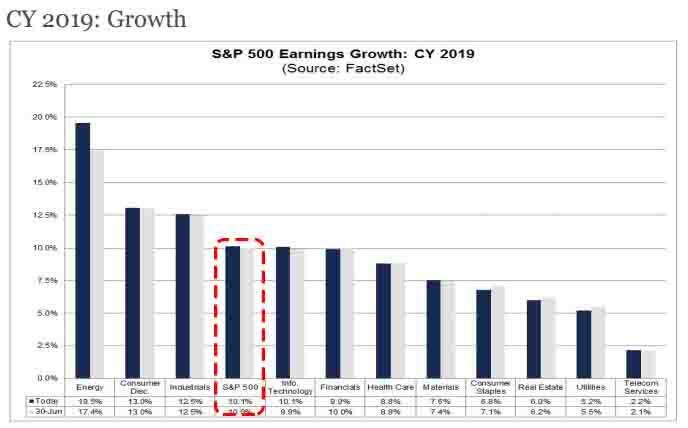 That the analysts have almost exactly 10% earnings growth (9.89%, to be precise) baked into the aggregate S&P earnings number for 2019 is also bit too convenient. The saving grace here: even at just 5% earnings growth ($169/share), the S&P 500 trades for 16.6x. That’s a reasonable enough number to make us believe markets don’t really trust the analysts’ numbers either. Summing up: Q2 is coming in strong, and this week should continue that trend. Earnings season has a habit of sucking up most of the market’s attention, which is a positive when trade war chatter is the competing narrative. We just wish analysts would pop their Q3 numbers sooner rather than later. The earnings pudding/sausage doesn’t get fresher with time.